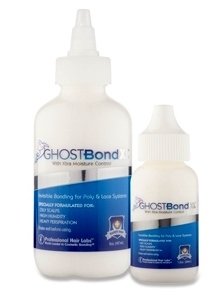 As a lace wig adhesive, Ghost Bond XL from Pro Hair Labs is a great choice. Pro Hair Labs assert that the product doesn't contain any toxic ingredients or latex. The wig adhesive is a water based adhesive and has been specifically formulated for oily scalps, heavy perspiration and high humidity - with those claims, Ghost Bond XL certainly has to be one of the best wig adhesives on the market and if you're researching wig adhesives, our guide has plenty of options. Ghost Bond has the ability to stay completely cured throughout its four week hold. As a wig liquid adhesive (glue) that works on both PU wigs and lace wigs, Ghost Bond is also impermeable to oil in addition to being water proof. This means is that once the bond fully cures, it totally limits the chances of any water, oils or sweat permeating the bond. So if you lead a very active life, live in a humid climate, have a tendency to perspire, or have oily skin (over active sebaceous glands) then Ghost Bond XL may well be the best lace wig adhesive for you. You can buy this in either a 5oz bottle or a 1.3oz bottle (which is often listed as a "touch-up" size). Both bottles are squeeze bottles so no brushes required. Latex free, no harsh solvents and a new formulation. After the fourth coating to the skin, wait for seven minutes and press the hair system into place. So, there you have it: if you lead an active life and perspire (whether running after children, playing sport or just being busy), if you live somewhere humid or if you have oily skin, this may just be the liquid wig adhesive you've been looking for. It's long hold time means you can wear your hair system and go... and keep going (working, resting and playing) for at least four weeks - and to us that sounds like good news!